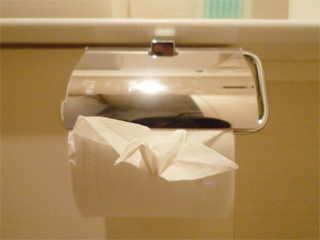 Toilet tissues are sometimes folded into triangles, like in this photo below. Supposedly this fold signifies that “the cleaning is done”. 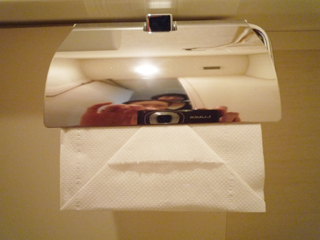 One day, a blogger thought that being around the toilet would be more fun if she could see not only triangles, but also other shapes on the tissues. 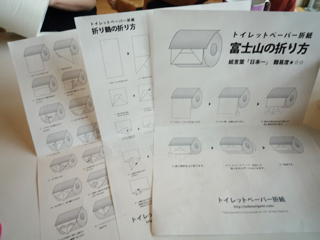 And, she found an interesting Japanese language website called Toilet Paper Origami. 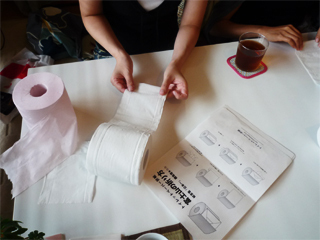 for folding toilet tissue into the shape of Mt. Fuji. Let’s start! 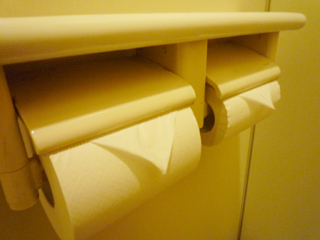 All you need is a roll of toilet tissue. 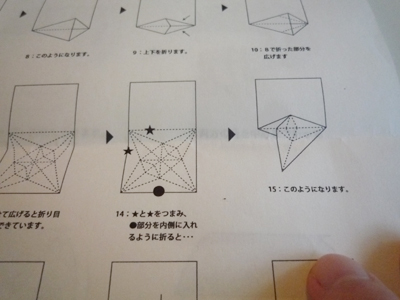 It looks quite easy so far. Done! This is obviously Mt. Fuji. See the snow line? 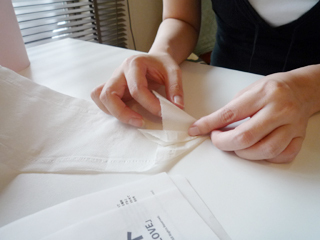 Here is a movie as well, demonstrating how to make Mt. 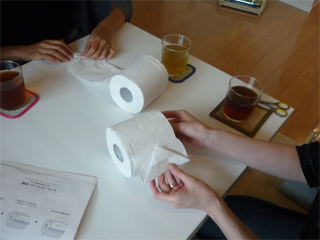 Fuji out of toilet tissues. Let’s go to another shape. I wonder what shape this is… Do you recognize it? 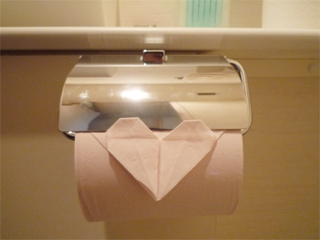 It is much more kawaii (cute) when made with the pink toilet tissue. Hmmm… This seems a little complicated. 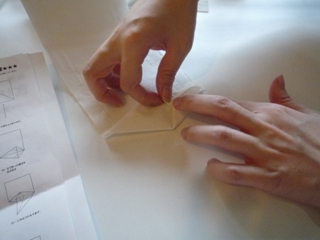 Making cranes with regular origami, which are perfectly square, is easy. 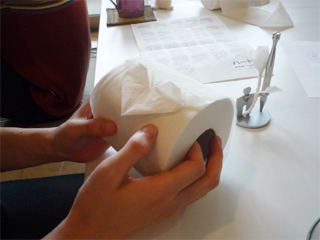 But it must be difficult when working with toilet tissues. 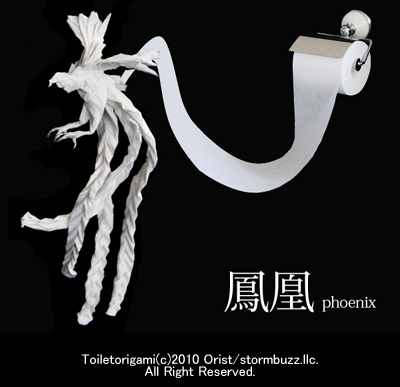 How could she manage to make a flower out of toilet tissues!? Haha (^^). 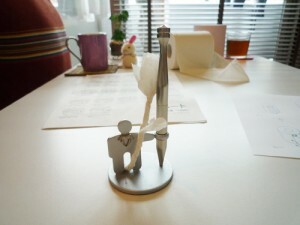 Maybe you can take the flower to the table for a decoration. A phoenix!? I can’t imagine how it is made. It’s just amazing!! 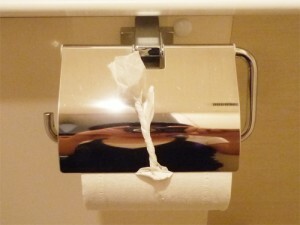 What are you going to do if you find an elaborate work of art like this in the toilet?